Explanation: On December 22nd, at 0022 Universal Time the Sun reached its southernmost point in Earth's sky marking the final season change for the year 2006. In celebration of the Solstice, consider these images of the Sun from an extreme ultraviolet telescope onboard the Stereo Ahead spacecraft. 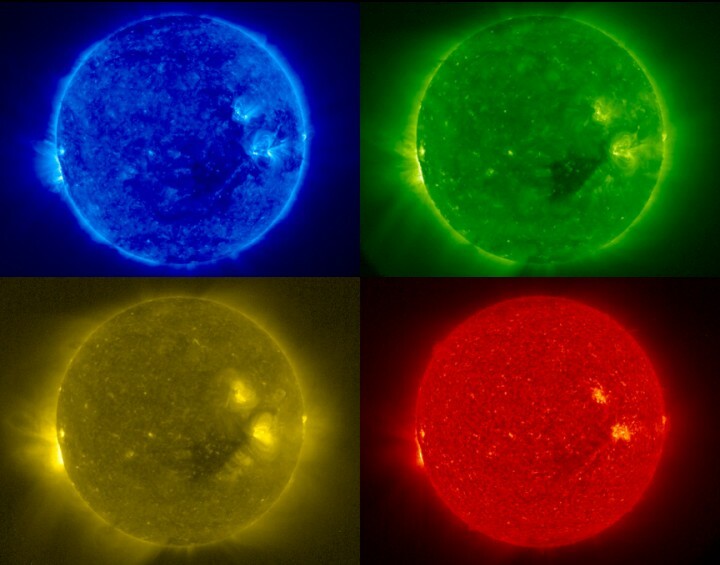 Recorded on December 4th, Stereo's first day of imaging, each false-color view highlights atomic emission in different temperature regimes of the upper solar atmosphere; 2 million kelvins in yellow, 1.5 million in green, 1 million, in blue and 60 to 80 thousand in red. The Stereo Mission will place twin spacecraft, launched together in October, into different solar orbits to conduct a three dimensional exploration of the Sun and the solar environment. After completing lunar swingby maneuvers, the A spacecraft is intended to orbit the Sun "Ahead" of planet Earth, and the B spacecraft "Behind".